2009 Volkswagen Jetta / Rabbit / GTI Pros and Cons | Page 1 of 1 | Why Not This Car? What drives people to buy (or not buy) a certain car? 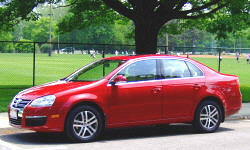 TrueDelta's members share 2009 Volkswagen Jetta / Rabbit / GTI pros and cons based on their real-world driving experiences. Excellent, responsive and reliable motor, superb six speed manual transmission. The TSi package has proven all I hoped it would be. I have always loved the handling/comfort compromise that the GTI has. The exterior is not too showy, but it is sporty and agressive. Same body as the GTI, nice looking, smooth lines, kind of a fatty. A lot of cosmetic parts work between the Rabbit and the GTI. The little 2.0L turbo four is incredibly torquey, though it manages to provide virtually no torque steer. The power delivery is fluid and fun making simple driving activities like merging on the highway or changing lanes something to look forward to.